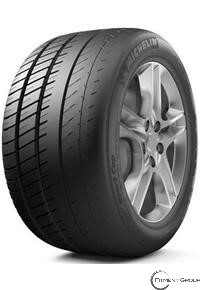 Ultimate max-grip wet and dry handling due to two race inspired sticky tread compounds. The outside shoulder tread compounds is optimized for dry handling while the inside shoulder tread compound is optimized for wet conditions. Able to generate tremendous cornering forces and grip in both wet and dry conditions due to an asymmetric, rigid tread design that employs a semi-slick outer shoulder and a very stable inner shoulder design which allows the use of softer compounds. Predictable and powerful cornering, even under severe on-track racing conditions, lap after lap, due to a lightweight, heat-stable rayon casing. Minimized evolution of the contact patch and the ability to maintain the tire's true shape by resisting centrifugal forces, all due to tapered and stabilized shoulder block region. Resistant to distortion from cornering loads, optimized high-speed handling and improved durability due to atapered and stabilized shoulder block region. Quick steering response and boosted cornering power due to the endurance of racing-inspired, high-tensile-steel cords and a polyamide belt package which provides tremendous support for the rigid tread and crown region. Minimized lag time between steering input and directional response due to textile sidewall inserts which are combined with a special high-hysteresis bead compound for crisps, sharp steering with excellent feedback. Consistent on-track performance at very high speeds, excellent tire wear and durability on the track or on the street due to a computer-optimized equilibrium casing shape.